The SES200 series of Transient Voltage Surge Suppressors deliver specification grade performance and features at an affordable price. 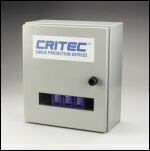 The versatile and compact design provides high quality protection for a wide variety of commercial and industrial applications where sensitive electronic equipment is to be protected. Internal electronics continuously monitor SPD protection, and the status is displayed on 5 segment LED bar graphs. Alarm contacts for remote monitoring are a standard feature. The SES200 provides up to 200kA 8/20µs per mode of surge material, making it ideal for the protection of service entrance panels and helping to ensure a long operational life under severe lightning conditions. The replaceable surge modules provide protection to L-N and N-G modes, delivering effective protection from both common mode and differential transients in single phase and three phase WYE systems. Models for grounded delta power systems provide L-L protection. Transient Discriminating (TD) Technology, which meets the safety standards of UL®1449 Edition 3, provides a superior life by eliminating the common temporary over-voltage failure mode of most SPDs. The SES is designed to mount adjacent to the service entrance panel with the connection being made via a small length of conduit. *Note: Ensure that installation of this model of the SES200 is not exposed to direct sunlight as solar radiation may cause internal temperatures to exceed the maximum specified and damage will result to the surge protective modules. A sun shield should be fitted if this unit is to be installed outdoors and exposed to sunlight. ANSI is a registered trademark the American National Standards Institute. IEEE is a registered trademark the Institute of Electrical and Electronics Engineers, Incorporated. NEMA is a registered trademark the National Electrical Manufacturers Association. UL is a registered trademark Underwriters Laboratories, Inc.